In South America we eat rice with almost every meal, typical lunches include arroz (rice) with something: pollo or chicken, carne or meat, pescado or fish, camarones or shrimp or even just a huevo frito or fried egg. Rice was always something very basic, nothing fancy, so when I heard of something called risotto it sounded very exotic and sophisticated; all of sudden rice was no longer something plain, you could make it “fancy”, at first I was a little bit afraid of even trying to cook risotto -especially after watching all these Italian movies that depict making risotto as some sort of secret heart surgery. So, it took me a while to talk myself into making it at home but finally I bought some Arborio rice at Trader Joe’s and just made a basic risotto following the instructions on the back of the box and it came out really good. After that I felt confident enough to get creative and make different types of risotto, adding meat or seafood or vegetables; basically it is an easy dish to make, very versatile and a good one to impress people (especially if they’ve been traumatized by those Italian movies). 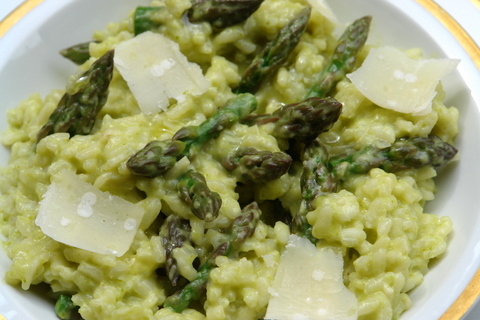 This asparagus risotto is a great way to enjoy all that yummy asparagus that is in season right now. I typically use chicken broth but you can also use vegetable broth if you want to keep it a vegetarian dish. My Italian friend Rossana says that she always adds a cube of chicken bouillon at the end (when you add the cream) and that it gives the risotto even more flavor. I love to add a drizzle of truffle oil when serving it, it gives it a nice finish; you can also use olive oil to drizzle if you don’t have truffle oil. 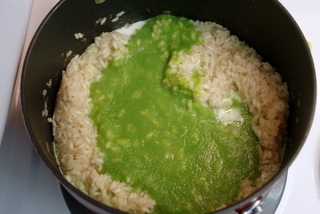 Finally, risotto is best when it is eaten as soon as it is made. 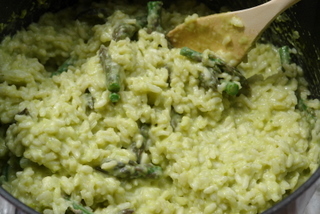 Risotto can be served as an appetizer in small portions or also as a main dish in larger portions. 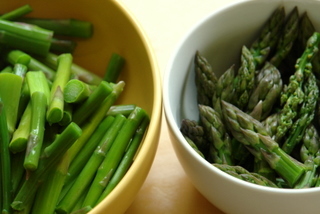 Cut the asparagus into small pieces, save the tips separately. 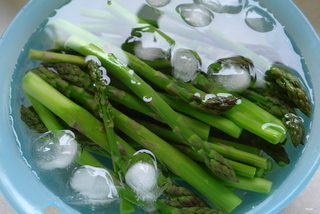 Puree the asparagus pieces with ½ cup of water and strain the puree. 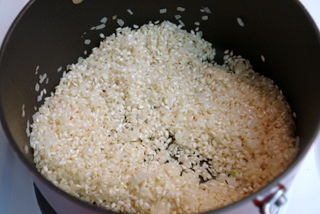 Warm the broth in a medium sized pan, keep it simmering as it needs to be warm when it is added to the rice. In a pan heat the butter, then sauté the onions and garlic until soft. 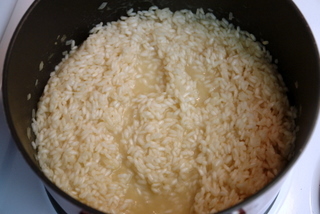 Add the Arborio rice and stir until coated with butter. Stir in the wine, cook until the wine is reduced. Add 1 cup of the warm broth, stir regularly and cook until the broth has reduced. Add another cup of broth and continue the same process until all the broth is used and the rice starts to get tender, about 20-25 minutes. 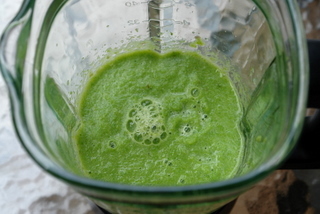 Add the asparagus puree and the cream, stir well and cook for another 3-5 minutes. 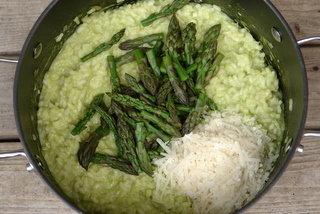 Add grated parmesan and asparagus tips, stir well. 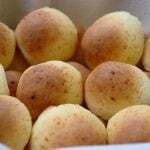 Serve sprinkled with additional parmesan cheese and drizzled with the olive oil or white truffle oil. Found this recipe randomly with a Google search – came out very well! Thank you! I actually substituted buttermilk for the cream since I had it on hand, and it tasted amazing; sort of a sour cream flavor. Thanks again. thanks for the recipe. I just served it to the kids and Iva. We all loved it. Hi Günter – Glad to hear that you all loved it! 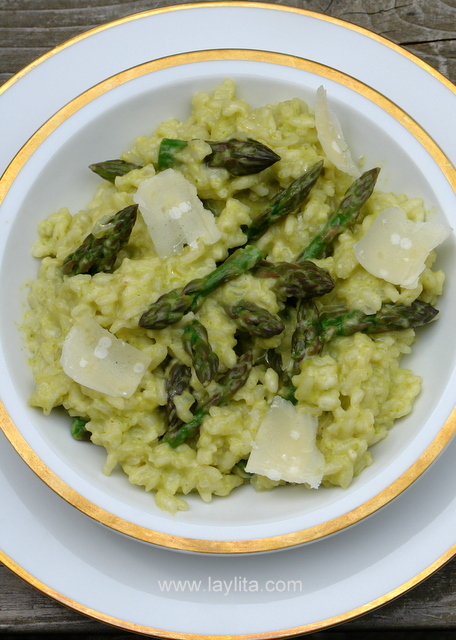 I look forward to trying your risotto one of these days (when we make it to Vienna). Saludos y besos para Iva y los bebes! 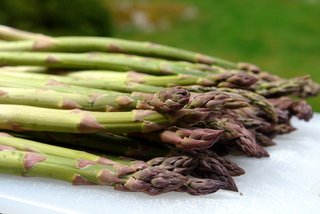 I live in the mountains of Colorado and have just harvested around ten pounds of Wild Asparagus! I have so much I barely know what to do with it all. I’m going to make this tonight! How lovely to have stumbled upon your rich and textured website. The recipes are beautiful so this will be the first one I will try! 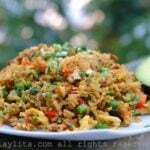 Looking forward to trying some of your traditional Ecuadorian dishes! Thanks!! I love your recipes thank you sooooo much for posting these beautiful pictures and the recipes you see my husband is Ecuadorian and I’m Portuguese, your blog has helped me allot with preparing some of the ecuadorian dishes that we all love to eat, thanks a million and please please keep posting more recipes you are truly an inspiration to me and my dear family. I’m almost done making it, and it’s already amazing. Thank you so much for passing on this recipe! Looks fantastic. Rich, creamy and smooth looking. Just perfect. I looove your blog! Congratulations! Sorry to ask such a basic question but how do you prepare the broth for this recipe? Hi Caro – I just used store bought broth, you can use either chicken or vegetable broth. Gorgeous photos. This shouts spring! Made this for the fam tonight. Only thing is, I added a lot more than 1/2 a cup of grated parmesan (didn’t add any salt bc the parmesan and chicken brothe have sodium, enough). My vegetarian hubby absolutely loves risotto. It’s time to make your dish for diner tomorrow. Thanks for sharing! 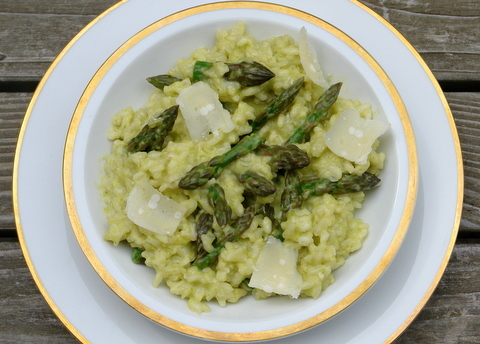 I’ve never made risotto but have loved it everytime I order it out. I love your site. It is so inspired. Your food look delicious. They make me want to try and taste it. Your photos are well taken. Thank you for sharing. 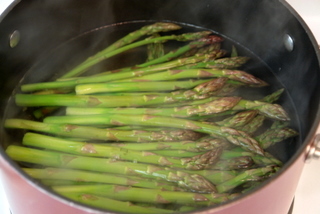 i got some fresh asparagus from the farmers market yesterday and now i can use them for this. 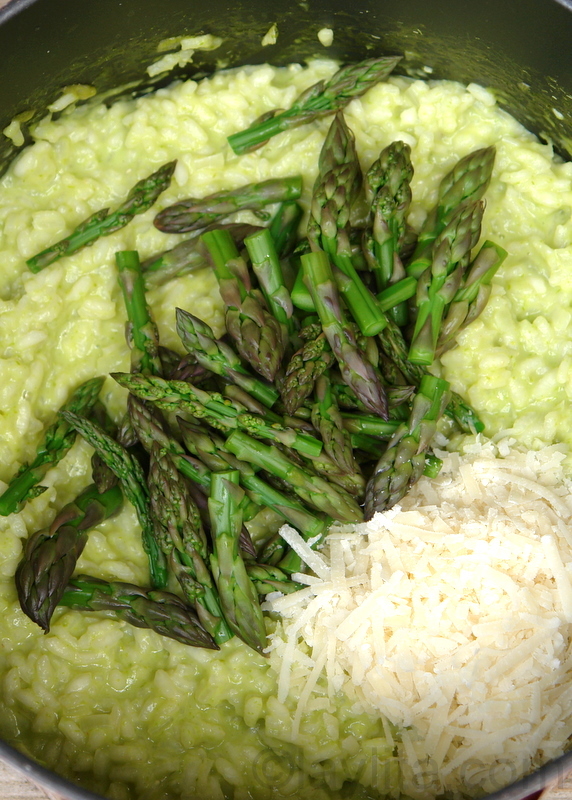 Liked the idea of pureeing some of the asparagus and adding to the risotto. Will give a more intense flavor! 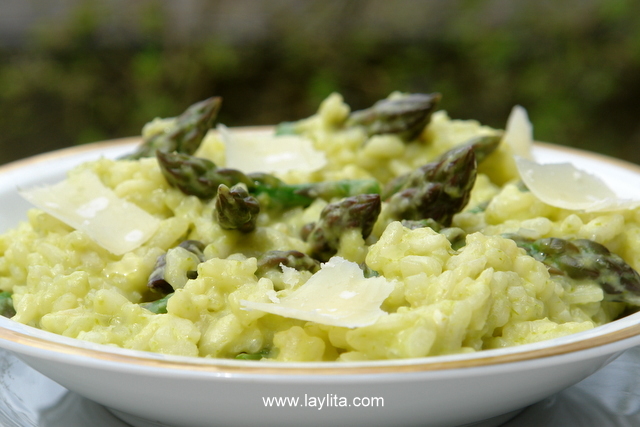 This is a beautiful risotto, Layla. Very well executed and photographed. I’m saving it now. Oh, yum! I just had asparagus last night.